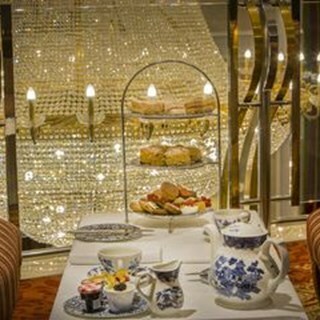 Afternoon Tea at the Knightsbrook Hotel is served on a Three-tier cake stand with accompanying Willow Pattern crockery. Afternoon tea at the Knightsbrook Hotel has an elegant selection of dainty savories, with finger sandwiches including Smoked Salmon and Cress on homemade brown bread, Goats Cheese Crostini with Basil Pesto on Tomato Bread, Honey Glazed Gammon Ham with mature Cheddar Cheese & Dijon Mustard, Roast Chicken, Ballymaloe Relish, Mayonnaise and Crispy Bacon. There are also freshly made fruit scones with fresh cream and preserve, along with our homemade sweets including Lemon Drizzle Loaf, Macaroons, Mini Pavlova and many more tasty treats made especially for you. With Black, Green and Herbal Teas and Coffees from our specialty menu, Afternoon Tea at the Knightsbrook Hotel is €16.25 per person or €28.25 per person with a glass of Prosecco. A lovely way to spend a relaxed few hours in fine surroundings, or to celebrate a special occasion. One of the most soothing and enjoyable rituals, Afternoon Tea is a lovely way to catch up with friend, celebrate a special occasion, or just indulge in a little treat to share with family and enjoy a delicious assortment of freshly made sandwiches, pastries, scones and cakes. At Knightsbrook Hotel & Golf Resort you can relax in the peaceful surrounding of our Hotel mezzanine overlooking our lobby and our handmade crystal chandelier. Take time to relax and enjoy a sumptuous selection of classic cakes, sandwiches and treats complimented by a choice of teas, coffees and infusions. 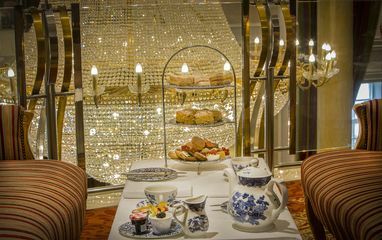 Afternoon Tea is served from 12pm to 5pm daily, pre-booking is essential. We also have a Gluten Free and Vegetarian Afternoon tea menu available. We had afternoon tea for 6 of us and we all agreed everything was lovely. Really enjoyed it. Beautiful hotel and great staff. What a lovely relaxing midweek treat. Delicious food in beautiful surroundings. Highly recommend. Lovely setting and food. Only problem was no one to pay at the end. A lovely day with my mother in law. I’ll definitely be back! Excellent service and food was fab. Atmosphere was fab with the Christmas music been played on the piano. Will defo book again soon. Nice afternoon tea, great value for money and fantastic service. Very slow service, had to get up ourselves and find a waitress or waiter to order, to get more tea etc. Not pleasantly greeted either. Not great value for money, as the sandwiches were very big standard.. This didn't really represent value for the price paid, particularly disappointed re the amount of sandwiches provided. Relaxed and Friendly atmosphere. Afternoon Tea was delicious. Thoroughly enjoyed the afternoon tea at Knightsbrook Hotel. We got asked for dietary required and got sat in the front of the chandelier which was a lovely setting. The food was lovely and worth the money. The only downfall I had was trying to get a fresh top up of tea as there was nobody about.